Arkansas quartz crystal; photo by Orbital Joe on Flickr (noncommercial use permitted with attribution / no derivative works). 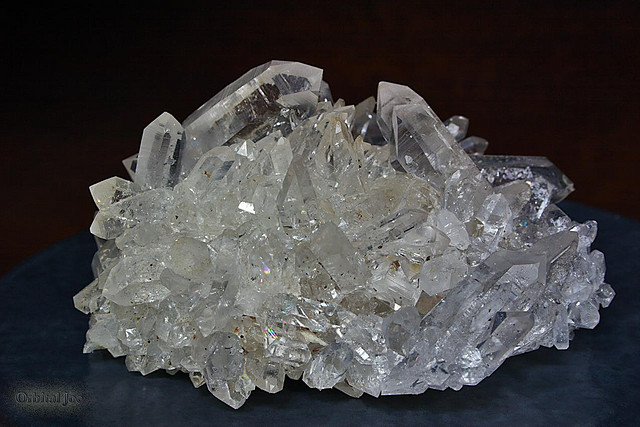 Arkansas designated the quartz crystal as the official state Mineral in 1967. Arkansas is one of a small number of places in the world with enough quartz crystals to justify commercial mining. Mined in the Ouachita Mountains of Arkansas, quartz crystals are used in computers and sold to tourists. Though nicknamed "Arkansas diamonds," quartz crystals are not true diamonds.